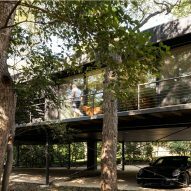 Architecture studio Wernerfield has raised this dwelling in Texas several metres off the ground, to provide guests with a sensation of "floating in the forest". 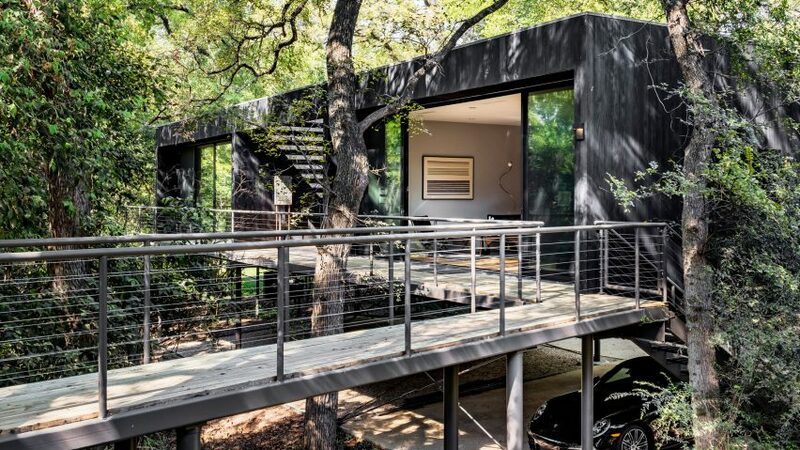 The PH2 Treebox was built on a wooded property in Dallas with an existing split-level home. Wernerfield, a local design firm, with charged with creating an "artful office and guest house" that pays heed to the site's natural beauty. Rather than placing the new structure at grade, the team elected to lift it off the ground – a move inspired by a raised patio attached to the main house. 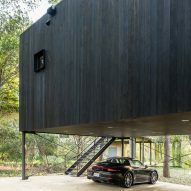 "The existing home's split-level plan provides an elevated deck at the rear that is wrapped by the forest," the architects said. "This sensation of being elevated and floating in the forest was carried forward as the central design concept throughout the project." The guest house sits atop 12-foot-high (3.6-metre) metal columns, with the underside of the building used as a parking area. 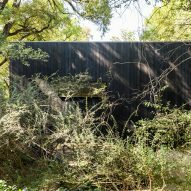 Exterior walls are clad in blackened cypress, which helps the dwelling blend with its site while also protecting it from the elements. 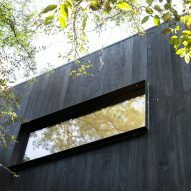 "Shou sugi ban charred wood siding was selected for the exterior siding for its naturally enduring properties as well as its visual discreetness, allowing Treebox to slip quietly into the forest," the team said. 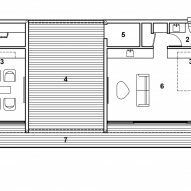 Rectangular in plan, the 1,536-square-foot (143-square-metre) building is divided into two rooms that are separated by a central breezeway. One room contains the guest quarters, and the other houses the office. A basic metal staircase leads up to dwelling. The west elevation is lined with a slender deck, which merges with a bridge that connects to the main house. Sliding glass doors enable rooms to be open to the outdoors. 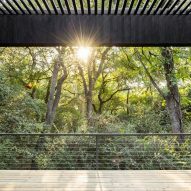 "The interior of the Treebox was a simple open-plan layout that captures the surrounding forest views with framed and punched openings," said the studio. For both rooms, the team used a restrained material palette and high-end decor by famous designers and architects. The guest area is fitted with a wood and glass coffee table designed by Isamu Noguchi and Barcelona chairs by Mies van der Rohe. The office features a 511 Ventaglio desk by Charlotte Perriand. Other furniture pieces include a coffee table designed by Eero Saarinen and chairs by Le Corbusier, Pierre Jeanneret and Perriand. 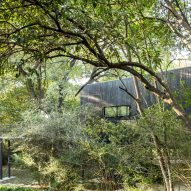 Wernerfield has completed several residential projects in its home state, including a slender residence organised around a pool terrace, and a low-maintenance dwelling that features concrete and glass volumes and a treehouse clad in pre-rusted steel. Photography is by Robert Tsai.